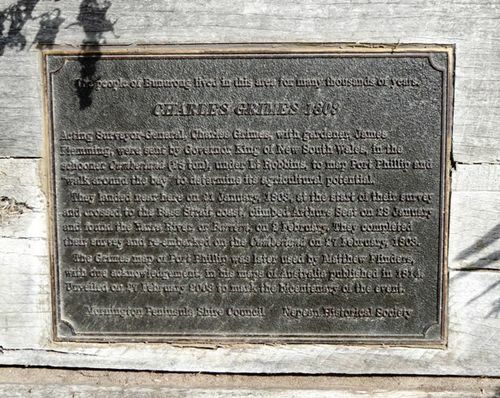 A monument commemorates the bicentenary of the survey of Port Phillip Bay undertaken by Charles Grimes and James Fleming in 1803. Acting Surveyor-General, Charles Grimes, with gardener James Fleming, were sent by Governor King of New South Wales, in the schooner Cumberland (26 ton), under Lt Robbins, to map Port Phillip and "walk around the bay" to determine its agricultural potential. They landed near here on 21 January, 1803, at the start of the survey and crossed to the Bass Strait coast, climbed Arthurs Seat on 23 January and found the Yarra River, or Barrern, on 2 February. They completed their survey and re-embarked on the Cumberland on 27 February, 1803. The Grimes map of Port Phillip was later used by Matthew Flinders, with due acknowledgement in his Maps of Australia published in 1814.